In an age where things move fast and everything is digital, these nostalgic moments are meant to be appreciated and recreated. Moms look back at their own summer memories savoring the sweet summer days they spent and how we can recreate that kind of simple fun for our own kids. Putting a limit on summer activities helps kids learn to slow down and appreciate the small moments that inevitably lead to lifelong memories. Child and Adolescent Psychotherapist and writer, Katie Hurley, LCSW, says, "Summer is traditionally a time for taking a break from the fast-paced schedule of the school year and spending time outdoors. But with all of the choices for camps and summer programs, many parents find themselves just as busy during the summer months. Putting a limit on summer activities helps kids learn to slow down and appreciate the small moments that inevitably lead to lifelong memories. Factoring in plenty of family time and sharing stories of your own summer memories helps families bond and spend time simply being together. In this fast-paced, technology-driven world, family and memories play an important role in learning to appreciate the present." We asked moms about their favorite and most nostalgic summer memories and we found that what Hurley says holds true — golden summer memories are made in backyards and pajamas, not in summer camps. See for yourself how moms recreate wholesome summer memories from their youth for their own children. ^ Erin Skibinki blogs at Home Everyday, a realistic and humorous guide to all things domestic. 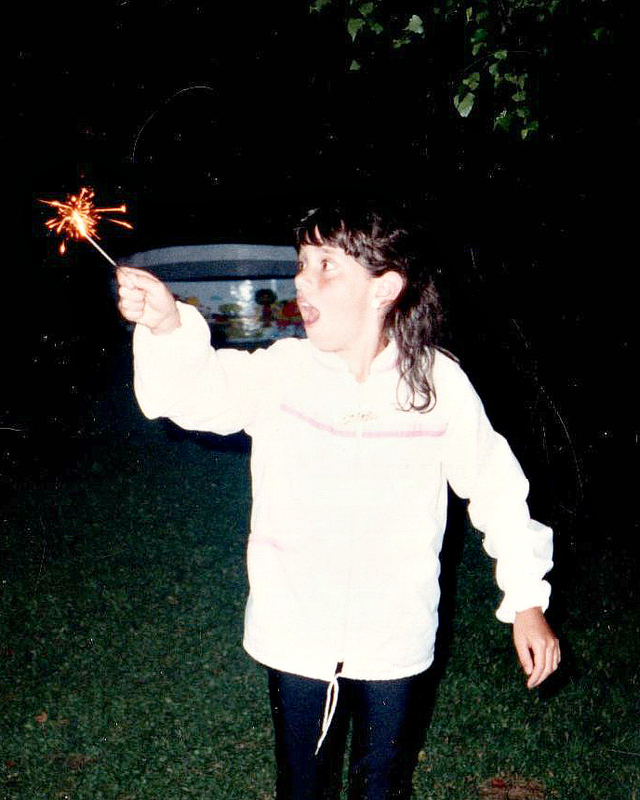 About her sweet summer memory, Erin says, "When I think of the summers of my childhood, I think simple. I was not involved in a lot of overscheduled camps and activities. Sure I played softball and did a basketball camp here or there, but what I mostly remember about summer was the simple pleasure of having "kid time." This meant sleeping on the screened in porch, reading, riding my bike, roller skating, catching fireflies, fishing, playing at the park, playing whiffle ball. Literally doing nothing and everything that makes summer so wonderful. Now that I am a parent myself, I realize how fleeting this time is with my little ones and am cognizant of the fact there will be plenty of summers where they will be in camps, activities, have jobs and just plain won't want to spend time with family. So I am soaking up this summer as one of the last where we will be just taking it easy and drinking plenty of lemonade." ^ Keely Flynn is a playwright who pens Lollygag Blog, a quirky blend of humorous musings on parenting, Chicago theater and the arts and fixing up a home that would make The Money Pit blush. About her sweet summer memory, Keely says, "My sisters and I used to love trekking into the woods to create "tree houses" on the forest floor; we'd tie back branches and make shelves and furniture out of anything we could find. When we'd finish with one "room," we'd forge a door or window and start anew on an adjoining room until we had a whole compound fashioned out of the dense woods. I can't wait to do this with my kiddos. Although unless we find someone superbly understanding at a local park district, we may have to venture outside of the city proper!" ^ Beth Meleski is a co-founder of Betwixt Girls, a lifestyle website for tween girls covering topics ranging from health and beauty to pop culture to etiquette, giving girls the information they need to stay current and in-the-know. 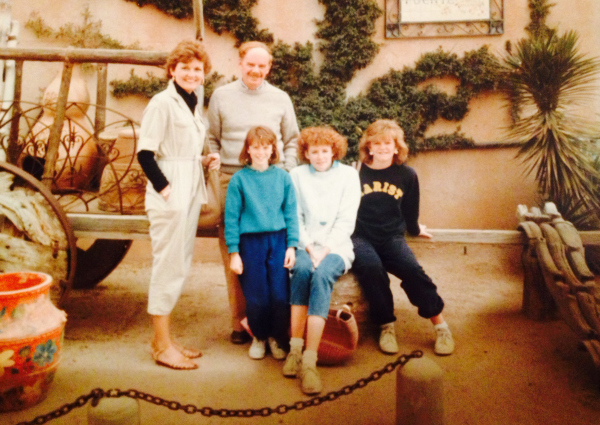 About her sweet summer memory, Beth says, "I didn't grow up in a family that played together. Most of our time spent under the same roof we passed in the halls on our way to different places. The exception was our daily bike ride during family summer vacations. Now that I have tweens, I understand my parents' insistence on this small ritual in a way I never did as a kid. We too are a family scattered, hastily catching a few moments at breakfast, lucky some days to all be in the house at the same time. These vacation bike rides have become a way of reassembling us, circling the wagons, filling us up for the time when we again disperse to our individual pursuits. So this summer we will re-create the bike rides of my youth. There will be bickering, I am sure, and jockeying for position. I will call out to the leader not to get too far ahead and I will try not to lag too far behind. But we will, for a short time anyway, all be heading in the same direction." ^ Kristin Shaw authors the blog Two Cannoli where she pulls your heartstrings with stories about bravery in love, life and relationships. Kristin also writes for The Huffington Post and is working on a children's book project. 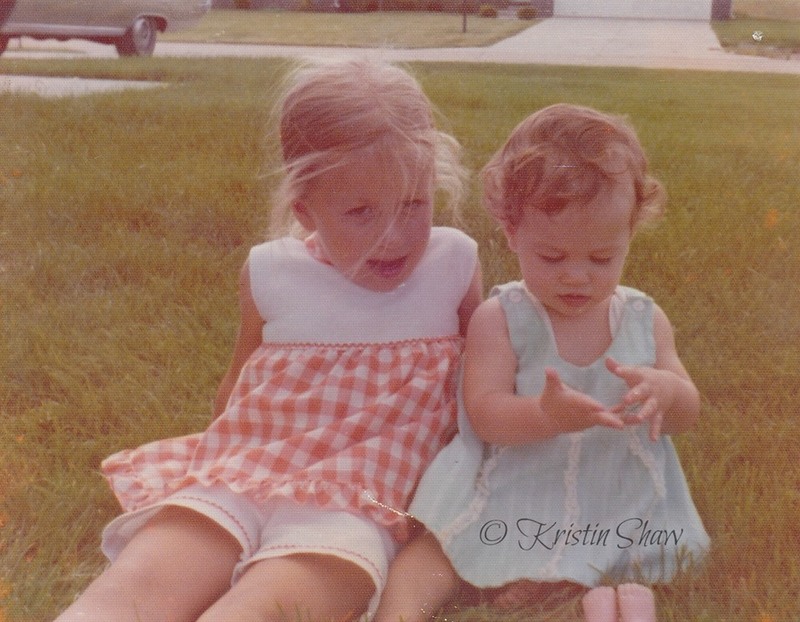 About her sweet summer memory, Kristin says, "I have great summer memories of making ice cream with my mom. We would pick fresh strawberries in a field nearby, crank up the ice cream maker and fill the well-loved silver bucket with fresh cream, gorgeous summer berries and sugar. We could hardly wait to take it out of the freezer to eat it and our family spooned it into bowls and sat in the screened-in porch listening to music and eating our cold summery dessert. We're going to start making our own ice cream very soon." ^ Denise Ullem lives in the Midwest with her family and writes at her blog, Universal Grit. Her work has appeared at Brain, Child, Parents Magazine and The Huffington Post. About her sweet summer memory, Denise says, "When I was young, my family used to trek to northern Michigan in the summers. Oh, how I loved those trips. Cool nights, hot sunny days and breezes whispering promises of magic. I still remember the feel of the hot sand on my feet. On one of these trips, we visited the Sleeping Bear Dunes. We arrived in the late afternoon and I started to climb the first of the big dunes of sand. By the time I arrived at the top, the sun was setting. 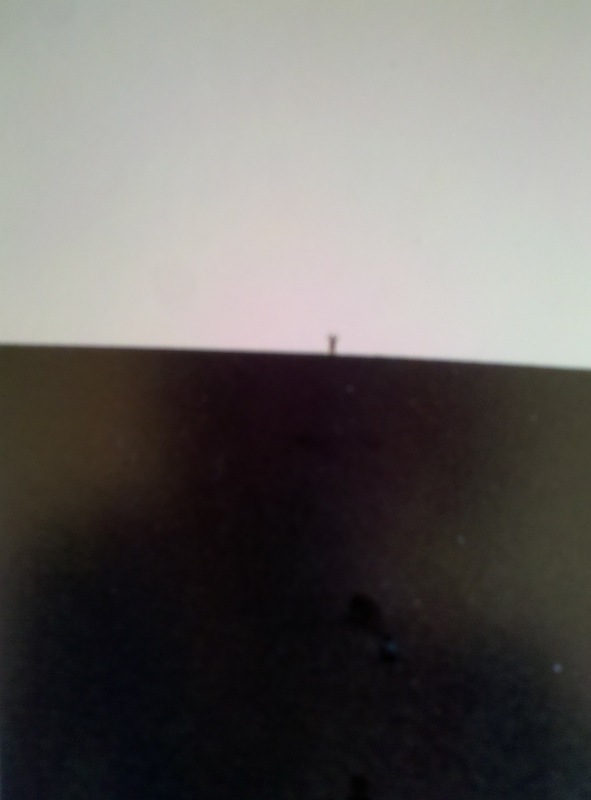 I felt so big at the top. My mother snapped this grainy photo of my triumph. I can't wait to take my children to this same magical spot this summer. I can't wait to climb with them, slip and finally reach the top. I hope that, once again, the sun will dip down and the cool breezes of evening will kiss our cheeks. We'll pull our sweatshirts close and I'll pull them into my arms, and into this memory, forever.​"
^ Leslie Marinelli, otherwise known as the Bearded Iris, is the new CEO of In the Powder Room, an online community for women, and the co-author and editor of the bestselling women's humor anthology, You Have Lipstick on Your Teeth. 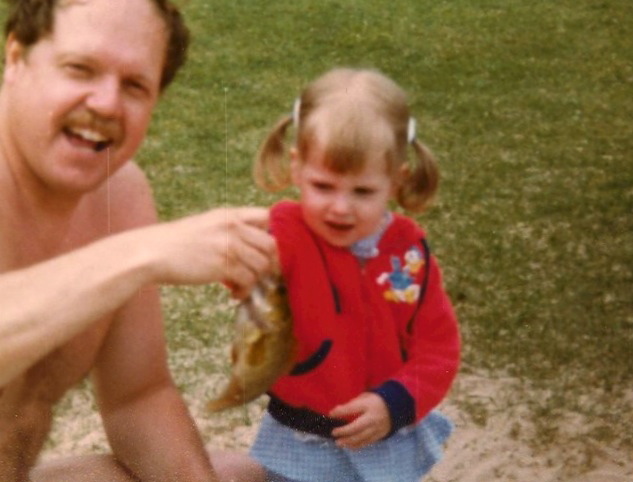 About her sweet summer memory, Leslie says, "I've always been a bit of a tomboy and spent most of my summers playing outside every day until the street lights came on. 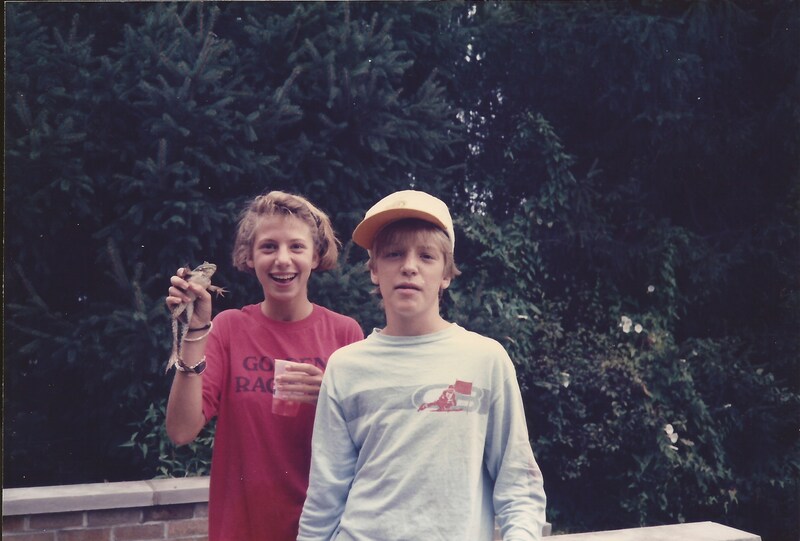 Some of my best summer memories involve fishing, climbing trees and catching frogs and lizards. My three kids are exactly the same way, or in other words, I have learned the hard way to always check their pockets before doing laundry."